In reviving Swanstons remarkable story from a dusty, almost forgotten treasure trove of bank archives, Eleanor Robin brings to light his considerable contribution to the economic, political and social life of Van Diemens Land and his leading role in the settlement of Melbourne. Melbourne by 1856 was growing in confidence and grandeur, as Henry Gritten’s fine painting of Swanston Street depicts. Captain Charles Swanston, the man after whom the bustling thoroughfare was named, would have been gratified. Swanston—heroic soldier of the Honourable East India Company, Van Diemen’s Land banker, legislator, pillar of Hobart Town society, fomenter of the squatting rush to Victoria—could always recognise a good commercial opportunity. His business tentacles stretched around the globe. Yet following the catastrophic collapse of the Derwent Bank, his desperate dash to the California goldfields and his mysterious death at sea, he was virtually expunged from the public record. 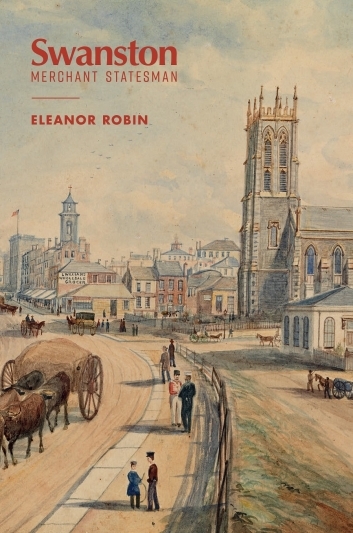 In reviving Swanston’s remarkable story from a dusty, almost forgotten treasure trove of bank archives, Eleanor Robin brings to light his considerable contribution to the economic, political and social life of Van Diemen’s Land and his leading role in the settlement of Melbourne.